I was interviewed for this article at Retaildietitians.com. With their permission, I’m pleased to share it with you. RDBA spoke with Jo Miller, Founding Editor of BeLeaderly.com, and CEO of Women’s Leadership Coaching, Inc. on how to break into leadership positions in business. What are some ways to influence others before earning a higher title? I think this is the great catch-22 that most aspiring leaders deal with: That you can’t get a promotion without showing that you can influence and lead others, but you can’t gain the influence without the higher level job title that comes with a promotion. But, it’s actually a myth! You can and must learn to influence without authority if you want to show that you’re capable of leading at a higher level. For anyone who has aspirations to climb beyond the job they are currently in, it is critical to find ways around that catch-22, and develop skills to “influence without authority.” If you can demonstrate that skill, you’re more likely to get promoted into a role where you have positional authority. It’s tough, but that’s the way the corporate world works. So how do you build skills to influence without authority? Don’t wait for someone to promote you, or hand you a leadership role or assignment. Find a colleague or a team who could use some motivational support, and provide it. Or find project that needs a leader, and commit to making it happen. Think about the end result you’re trying to achieve, and try to understand what others might find exciting and motivating about achieving that goal. For example, do they crave a challenge or have an interesting technical problem to solve, do they love being part of a winning team, or are they anxious to present in front of senior executives? How can you tap into their innate motivation? That’s the most powerful source of influence there is. Do you advise up-and-coming employees to negotiate for a higher title before taking on any leadership projects? Someone once said “Don’t accept responsibility without authority” and it sounded good, so it became part of conventional leadership wisdom. But in the real world, if you try to negotiate a higher level title every time someone offers you a leadership project, but you haven’t yet established a track record of meeting commitments and delivering outstanding results, you will seem entitled and likely be denied the promotion. So my recommendation is to take the assignment, knock it out of the park, then ask for another one and knock that out of the park too. When you’ve established a well-documented track record of success, bring those facts to your management as you ask for the promotion. Why are influencing skills so important to being effective at your job? It helps to understand what influence really is, and I propose that it is about your ability to make things happen that you can’t accomplish alone. There comes a time in everyone’s career where you have a goal or are given a result to achieve, and it is bigger than you can accomplish alone. If you can’t do it yourself, you need to lead, motivate, engage and influence others to get on board. Without influencing skills you’re limited to accomplishing what you can do on your own. It’s a tough leap to make, from being a “doer” to being a leader but essential if you want to really make a bigger impact in business. 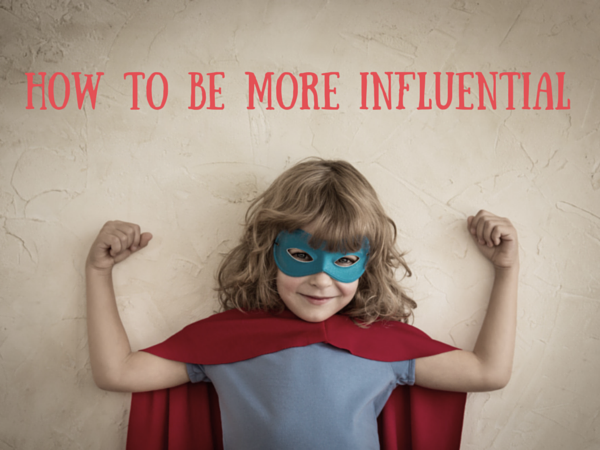 What is positional influence and why isn’t it the only or best way to influence? Positional influence is the influence inherent in your job title and role. Our corporate workplaces are hierarchical for the most part, and someone whose business card says Vice President is assumed to have more power than an individual contributor. But titles don’t tell the full story. We have all known someone who was lower in the traditional hierarchy who was the go-to person if you needed to get something done, and we have all worked with a leader who was promoted beyond the level of their competence. So while a high-level job title may initially open doors for you, you simply can’t rely on it alone if you really want to lead and influence others, build high-performing teams, and make great stuff happen. Positional influence isn’t all that we make it out to be. Anyone at any stage in their career can make great things happen, with interpersonal influencing skills. A special thank you goes out to Retail Dietitains Business Alliance for allowing me to share this article.